Outdoor kitchens and outdoor kitchen plans are not a new phenomenon, although many people and companies promoting outdoor kitchens would like you to believe otherwise. Our forefathers used to cook outside when they conquered and traveled the world. Think back to the Europeans exploring America, Africa and Australia. They conquered those continents on tummies that were filled by outdoor cooking, done by either themselves, or their wives and daughters mostly. There were no luxuries in those days and living was hard. In the meantime, times have changed and thankfully (I for one am very grateful), we do not have to explore new continents on horseback anymore, so we can use our spare time to improve our homes and design new outdoor kitchens and other nice things in and around the home. Nowadays an outdoor kitchen is an indulgent luxury and nothing at all like the kitchens used by our forefathers. I think we all agree that an outdoor kitchen is actually more than an indulgent luxury; it is a necessity in the modern home in countries where the weather allows for it. 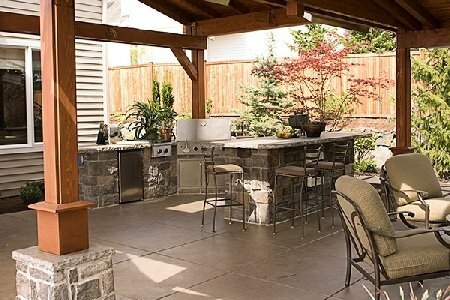 Let's explore some specifics when it comes to outdoor kitchen plans. In South Africa, where the weather is great and most people are almost always outdoors, outdoor kitchens fit into our lifestyle like a well-fitted glove. It is not just here that it is such a rage lately, but all over the world. most of the infrastructure is in place. 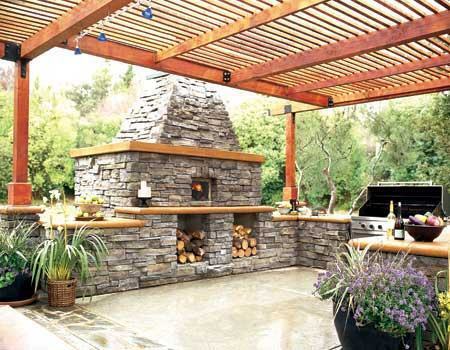 whether you are going to design and build the outdoor kitchen all by yourself or use a contractor. If you do not have an existing patio or deck, then it is even better as you can now design your own outdoor kitchen from scratch. You want your outdoor kitchen close enough to the house to easily run your utility lines (e.g. electricity, water, gas, and maybe even a phone line), but not so close that it feels as if you are still practically inside your house. You must make sure that the area you select is big enough to incorporate everything you want to do in your outdoor kitchen, as well as everyone you want to accommodate and entertain there. Position - It is important to consider your privacy when you choose a position for your outdoor kitchen. It is no use having a beautiful spot, but no privacy from the neighbours. Climate - The primary goal of your outdoor kitchen is to enjoy the outdoors, so take the prevailing winds into consideration and the passage of the sun for shade. Once you have decided where your outdoor kitchen will best fit into your outside space, there are a few practical things to consider. You must find the closest connection point from where you will run your utility lines. It is best to do this before you dig and throw any foundations. Take care with this aspect, as it will save you time, money and many headaches later on. It is never pleasant to have to dig it all up and move it because you did not consider all options at the design stage. Normally one wide trench can be the starting point and from there some branching off to the end destination points will do the trick. Remember to dig you trenches deep enough. Rather too deep than too shallow. I always suggest to dig the trenches between 500mm and 750mm deep (below the surface). Also see my tips and tricks in my backyard kitchen page for more information on this. Once the trenches are in place, put your conduit in and run your cables and voila..... time to cover the trenches up and once that is done, the serious work on your outdoor kitchen plans can begin. From here it is very much as if you are designing an indoor kitchen, except that the counter tops, kitchen cabinets and lighting must be waterproof. If you fit a refrigerator, make sure that it is protected from the outside environment, especially rain and wind. Do you want a kitchen island or not? Put just as much thought into your kitchen layout as you would for your indoor kitchen. Your kitchen cabinet design is still an essential part of the functioning of your outdoor kitchen so think long and hard when deciding on the materials, the placement and the design of the cabinets. The kitchen lighting design is also just as important as you would like to create a beautiful ambient in the evenings. I think you get the drift of how to go about the design of your outdoor kitchen plans. Many people prefer gas braais (replace braais with barbeques or cookers, depending where you come from) in their outdoor kitchen, as it is easy and quick to cook with. I personally prefer to have a wood fireplace as well, as shown in the top picture. It creates an atmosphere where family and friends want to gather around and have wonderful times. I know that many cities do not allow smoke fires anymore, so in that instance a gas cooker is the only option. The nice thing about wooden structures, as shown in the picture above, is that they provide many places to fit hooks for hanging your utensils and pots. It also gives a lovely rustic impression (OK, I am from Africa, we just loooove rustic), and it is something that the do-it-yourselver can quite easily do without help if you plan it well. One important thing to remember is that many countries require permits and building plans for outside structures. Here in South Africa they are not too strict with stand-alone walls and wooden structures, but once you put a roof over your outdoor kitchen, you will need approved outdoor kitchen plans. Some countries even require permits for the trenches you will dig for the utility lines. Please make sure you adhere to the correct rules and regulations as it is heartbreaking to work hard on your new outdoor kitchen only for the counsel to instruct you to break it all down again. Have your say about what you just read here! Please leave me a comment in the box below. Dawid Jacobs | Why should you believe in me and what you read here on Home Lovers Ideas? This site uses British English, so the spelling of certain words (like colour or favourite) may seem unfamiliar to some.